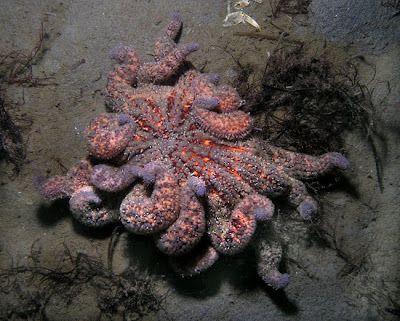 The Echinoblog: Curious postures in Pycnopodia helianthoides!! 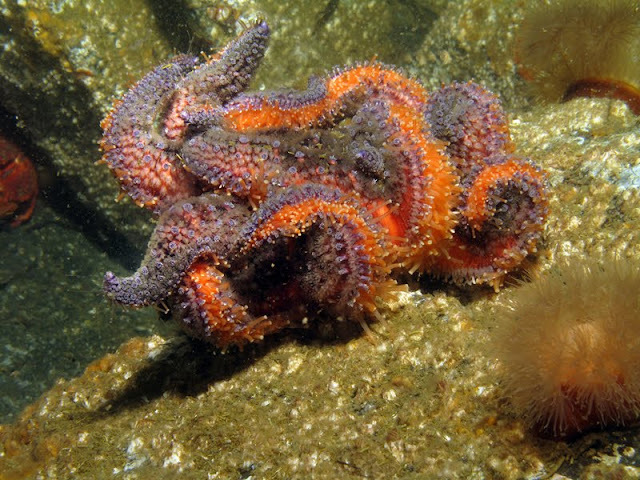 Are these related to Starfish Wasting Disease? Curious postures in Pycnopodia helianthoides!! 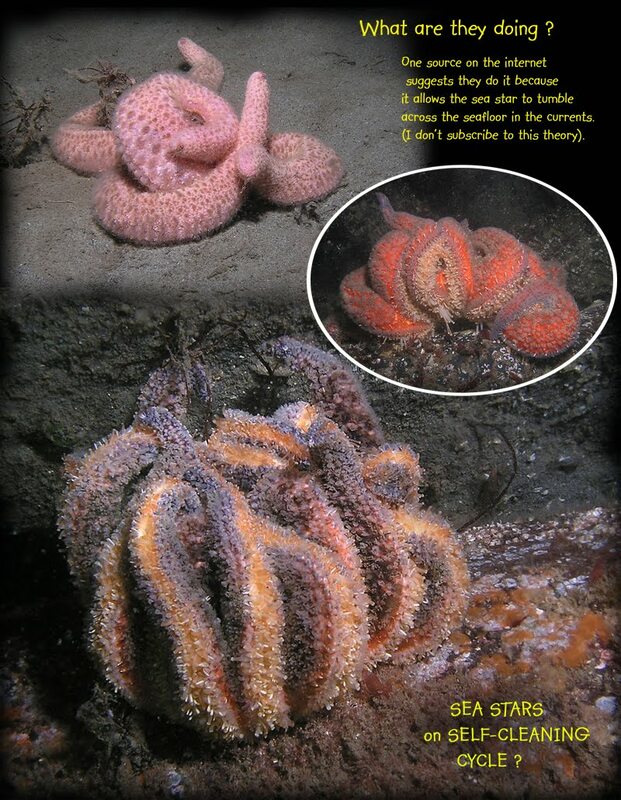 Are these related to Starfish Wasting Disease? A brief UPDATE: My colleague Allison Gong at California Naturalist reports pictures by Ron Wolf showing similarly odd contortions in California seastars with wasting disease which she observed under aquarium conditions. Were these contortions the prelude to wasting disease?? 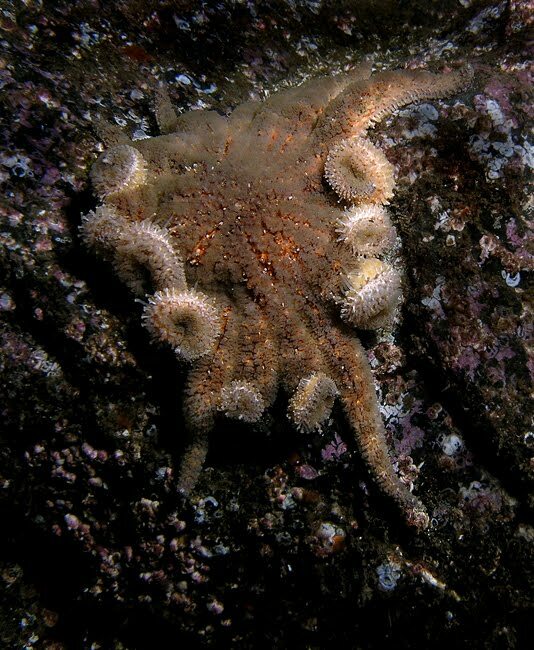 The other day, I received an email with some images taken by Jan Kocian, a photographer/diver in the Pacific Northwest (I believe in Washington state) and he has been observing some unusual postures in Pycnopodia helianthoides (the sunflower star). Just kind of casually lying about, flattened with their body splayed out. Part of my attraction to echinoderms in general is that their evolutionary "solutions" to so many of life's challenges are so...odd. Behavior or adaptations observed in a 4 legged mammal might be directly obvious. If you spy some vertebrate with a head and 4-legs that you've never seen before, it will probably have a predictable suite of behavior. It might follow a trace of odors with its nose or itch itself with one of its legs. But what if it has no head? Or 20-25 legs?? -some sort of grooming behavior-removing parasites, etc.? 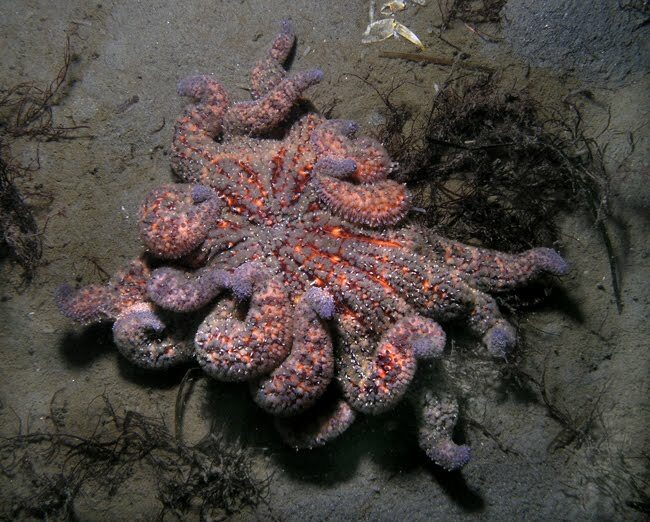 Have YOU-the Echinoblog reader seen this? Or have an explanation? Please do enter in the comments below! perhaps it's the first case of cultural phenomena among echinoderms? ie. it's dancing! No worries! All manner of comments are welcome so long as they are not spam or mean-spirited! Perhaps pollution/bad water quality? 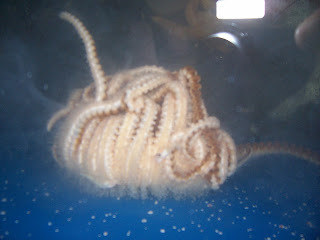 I've had sea stars fold up their arms in my aquarium if my nitrate gets too high... perhaps other toxins could cause the same thing. 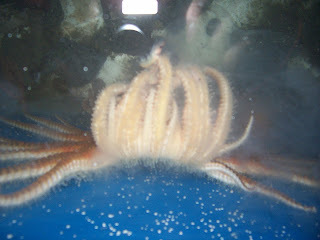 Mimickery: In that form, it does look a bit like an octopus, an anemone or a bundle of worms. Perhaps it is mimicking a toxic species? Parasitism: Perhaps they have been parasitised by something that has modified their behaviour to increase their visibility to predators? must I explain the obvious. It's tantric yoga. The Tantric aim is to sublimate rather than to negate relative reality. This process of sublimation consists of three phases: purification, elevation, and the "reaffirmation of identity on the plane of pure consciousness." From the looks of it they are all in the "purification" phase, very intense. 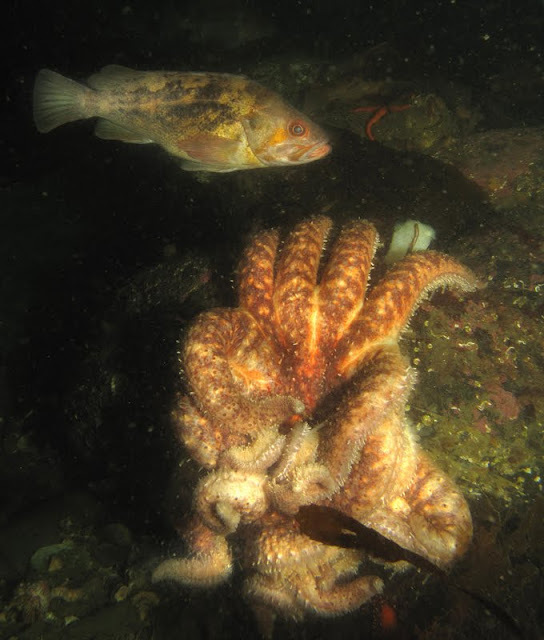 I have noticed a similar behaviour in Pisaster ochraceus on a few occasions. Typically it was when they were in distress, autotomizing an arm, had an injury etc. Not sure with these Pycnopodia though.